Single panel size is 4 3/4" x 4 3/4"
Matte CD Jewel case front insert single panel. 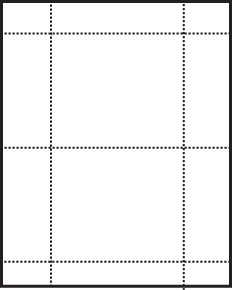 Two sides, no fold, Two 4 3/4" x 4 3/4" inserts per sheet. Recommended for Inkjet or laser printers. 32lb stock. On 8 1/2" x 11" sheets perforated with micro perforations to tear down to two 4 3/4" x 4 3/4" inserts. Each 4 3/4" x 4 3/4 insert is a custom fit for the front insert area of a CD jewel case.